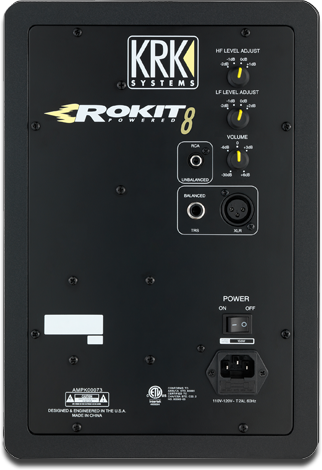 The largest and most powerful model in the Rokit series, the KRK RP8 Rokit 8 Generation 3 studio monitor is an excellent 2-way powered speaker from a company with a long-standing reputation for audio design and innovation. The RP8 G3 pushes 100 watts through a 8-inch woofer and a 1-inch soft dome tweeter. The monitor has a frequency response of 35 Hz - 30 kHz and an impressive Max Peak SPL of 109 dB. 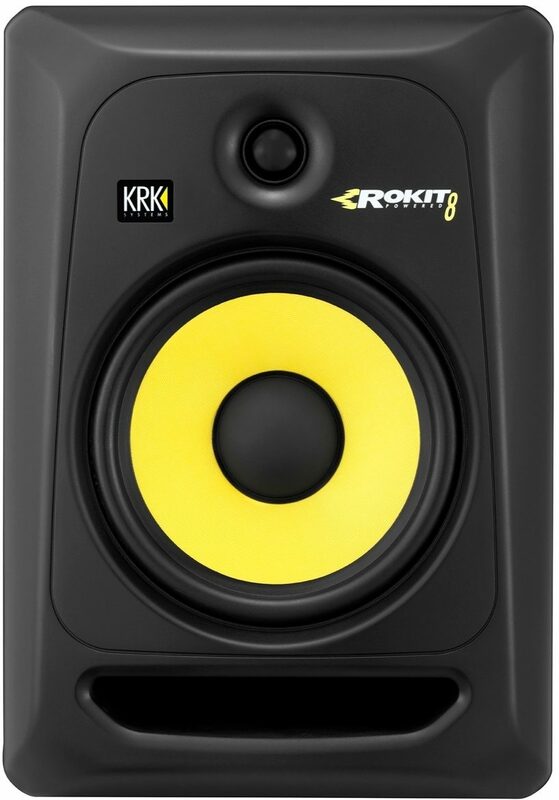 - 2x speaker isolation pads: 6.5" x 11" x 1.5"
The 8-inch woofer in the RP8 G3 is an Aramid glass composite woofer with KRK's trademark yellow covering. It handles 75 watts of the total output. The 1-inch woofer is of a soft dome design and channels the other 25 watts. The rear of the RP8 G3 has a 1/4-inch balanced TRS input, and a balanced XLR. There is also an unbalanced RCA input. KRK's Rokit Generation 3 speakers are made from medium-density fiberboard material covered in black vinyl wrap. They are crafted from a custom composite that ensures a strong forward throw with no cabinet sound coloring the mix. They are also durable and will transport easily if you need to move your listening station from place to place. Part of the third generation of KRK's ubiquitous Rokit line of studio monitors, RP8 G3 speakers have been receiving excellent reviews since their release -- and you'll understand why the first time you plug them in! A wide frequency range, ultra-low distortion at any level and supreme reference audio separates the KRK Rokit 8 Generation 3 Powered Studio Monitor from all the others. For a quarter of a century KRK has been the professional's choice for mixing and mastering hit records around the globe. And KRK's ROKIT studio monitors have been the most popular choice for accurate monitoring, selling one million systems over the years. Now KRK introduces the ROKIT Generation 3, continuing the legacy of performance ROKIT's have become known for. So whether you're just starting out in desktop recording, or you've already laid down a few thousand tracks, give a listen to the ROKIT Generation 3 line of monitors and experience a standard in performance and accuracy that raises the bar once again.
" KRK RP8G3 Rokit 8 G3 Powered Monitor "
Overall: Great monitors! Fantastic sound clear clean flat response. Great bass sound. "KRK RP8'S - O M G !!!!" Overall: These speakers are trully unreal. I have been working with home studio work for some time now and these have blown my mind away. I had the 5's and the 6's but hands down, these 8's hold their weight. I use a Behringer mixer board and plug in my POD HD500 on a stereo channel while playing some tracks previously recorded and the highs are sweet and not piercing and the lows really put in a rumble. I only have each of the 8's power half way and i literally make the snare rumble. The mixer board's master volume at around 60% - 70% and my work area rumbles, you can barely hear your self think and yet no distorded sound. Really crisp. These speakers are awesome for home studio work. If you have the $$$, invest in these babies. ZZounds has always treated me good. I have bought about 80% of my gear through them and the idea that you can get these babies while you pay is da bomb!!! If you're serious about quality sound for your quality work, these speakers are it. These are not your average amateur studio speakers! 17 of 19 people (89.47%) found this review helpful. Did you?